Simply put, men have different skin needs than women. 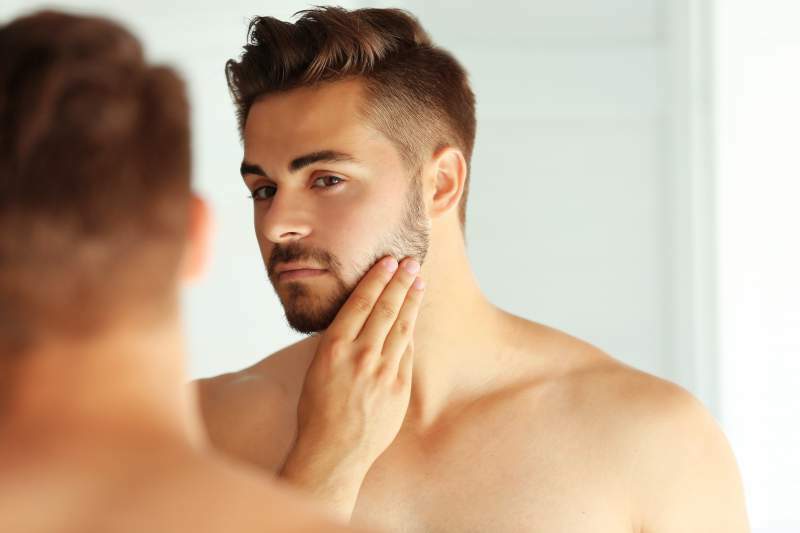 Because their skin is biologically different than a woman's, and the fact that they have facial hair, men need a distinct approach to taking care of their skin. 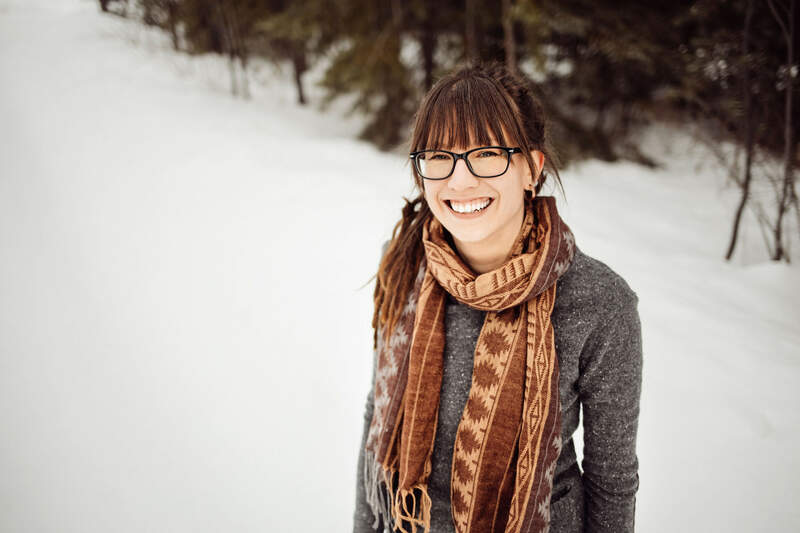 This page is meant to inform you on how men and women's skin differs as well as to give you tips and advice on taking care of your skin naturally. You will also learn what products we recommend for an organic skin care routine. Testosterone increases the of men's skin, making it 25% thicker than women's. Men have 20% oilier skin than women. Men's skin has a tougher texture. Men have a higher collagen density than women. It is said that men look 15 years younger than women of the same age. However, women are more diligent with sun protection, so the aging difference is not readily seen. A man's skin thins gradually with age, whereas a woman's stays about the same thickness until she reaches menopause. Men continue to have greater sebum production after puberty due to androgen secretions. 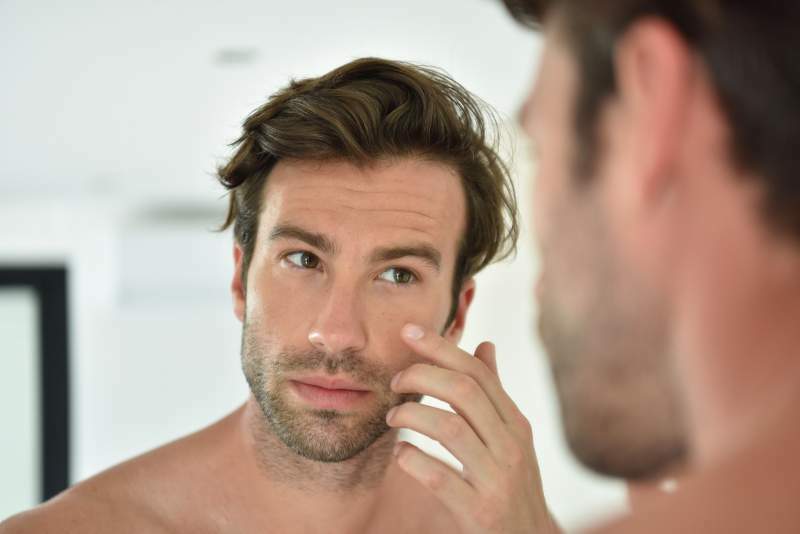 This is why men often have longer lasting acne. Men's skin produces more sweat, making it more hydrated than women's skin. 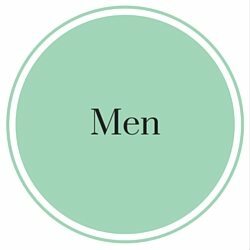 Due to shaving, men often have combination skin - dry areas and oily areas. Shaving compromises the skin’s acid mantle. Daily shaving stresses and irritates the skin. Shaving removes the top layer of skin, leaving the immature, sensitive layer exposed to external influences. Men have warmer skin due to more blood vessels. Men's skin is not as absorbent due to its thickness and smaller oil glands. 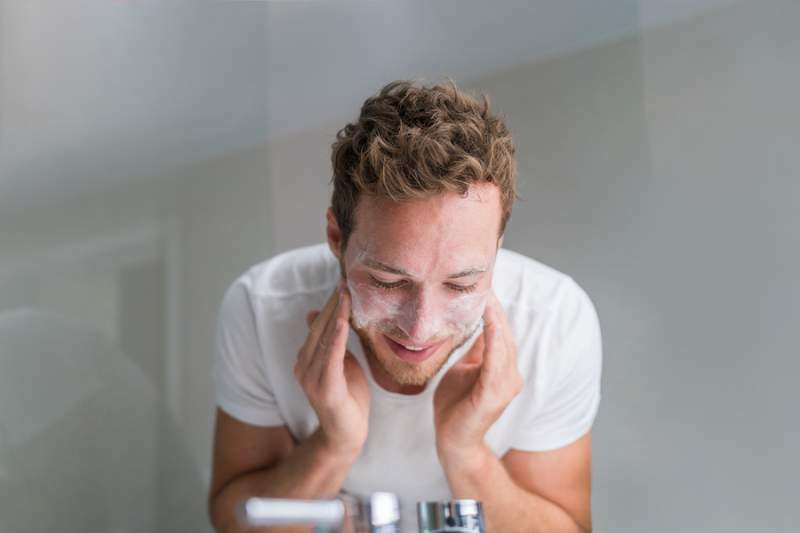 ​These differences mean that men need products that absorb quickly, help minimize shaving issues, and are lightweight and non-greasy. To get the best skin care routine, you need to take your skin type into account and use products that fit that skin type. Even though men tend to have oilier skin than women, not all men have oily skin. ​One of the most valuable products for men's skin is their cleanser. Men need to cleanse their skin twice a day to help keep their follicles clear. 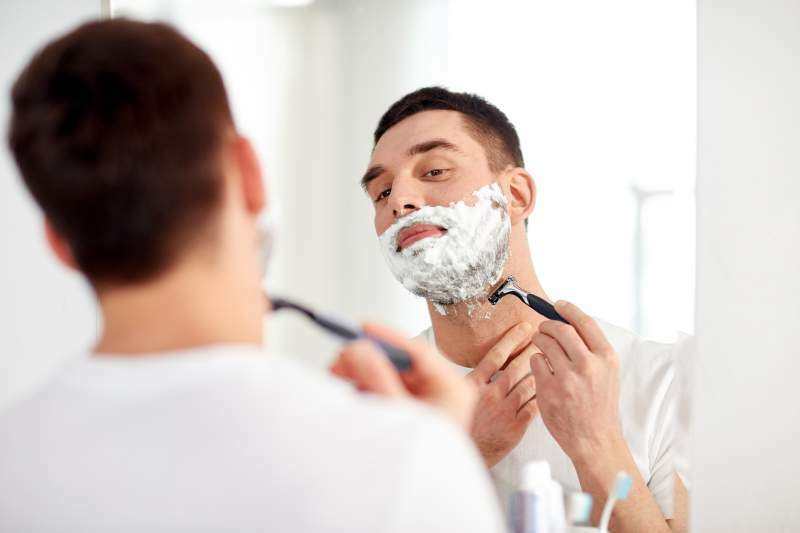 Men who shave will find that their cleanser helps ensure the razor has a clean shaving surface to avoid ingrown hairs and razor burn. Wash your face morning and night with a cleanser meant for your skin type. Use warm water - not hot - to cleanse your skin; hot water will dry out your skin too much. Use a dime-sized amount of cleanser on your skin and wash with gentle circular motions - no need to be rough. Rinse with cool water to close pores. ​Use a clean towel to pat your skin dry; rubbing will pull your skin and contribute to wrinkle formation. 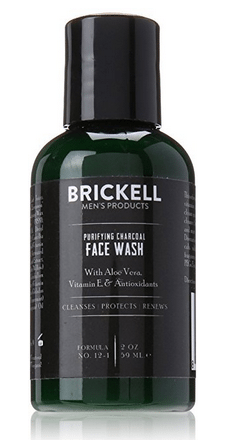 Brickell ﻿﻿ Purifying Charcoal Face Wash for men with dry, sensitive, and normal type skin. 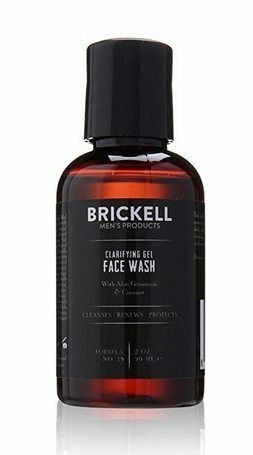 Brickell Clarifying Gel Face Wash for men with normal or oily skin. Facial scrubs or exfoliating cleansers will help get rid of dead skin cells and debris that make your skin look dull. They also help prepare your skin for shaving. You should exfoliate your skin 1 -3x a week, depending on your skin type. Dry/sensitive skin will need less, while oily skin will need more. After your normal cleansing, apply a dime sized amount of scrub to your face and gently rub the scrub over your skin. Concentrate on areas where dead skin tends to build up, usually the forehead, nose, and neck. Be very gentle around the eye area. Scrub before you shave to elevate and loosen up whiskers for a closer shave. 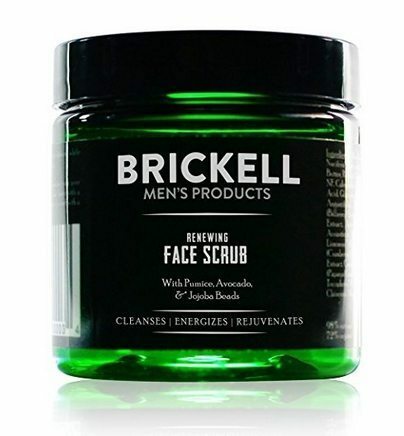 Brickell Renewing Face Scrub for Men - Uses powerful natural scrubbing particles to remove dead skin cells, exfoliate, unclog pores, and break down tough facial hair for an ultra close shave. 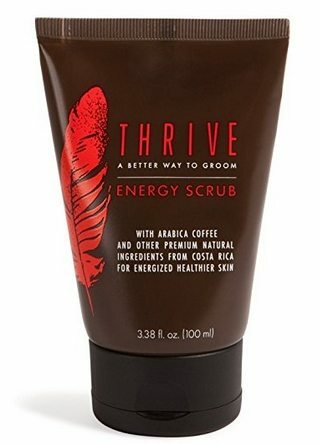 Thrive Natural Men's Face Scrub - Premium plant-based exfoliants inside this scrub remove oil, sweat, SPF, and other impurities without drying the skin. Scrubs can be harsh on the skin, causing micro-tears. A chemical exfoliate rids the skin of dead skin cells without the roughness. A leave-on BHA exfoliate is an excellent choice. 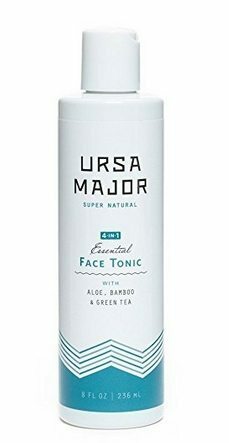 ​Ursa Major Face Tonic - A leave on liquid tonic that cleans, exfoliates, soothes and hydrates. Contains an AHA and BHA complex to brighten dull skin. Toners calm irritation and redness and reduce pore size; they also reduce oil and shine. A good toner can help counteract some of the irritation associated with shaving. Toners will increase the permeability of your skin allowing your moisturizer to absorb better, bringing the beneficial ingredients deeper into your skin where they can do their best work. A well-formulated toner helps repair and restore your skin’s surface. When you have finished cleansing, your skin is thirsty. Now is the time to feed it nourishing ingredients, antioxidants, and essential fatty acids. An effective toner will contain all of those things, and your thirsty skin will drink it up. 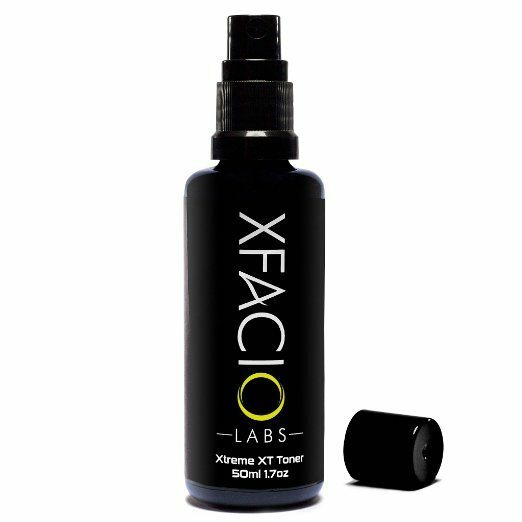 Xfacio Labs Xtreme XT Toner - Contains collagen stimulating Vitmain C and cell-regenerating amino acids. This toner is alcohol free, and contains one of the most potent anti-aging peptides, Matrixyl 3000. ​Shamanuti Seaweed Toner - An alcohol free toner containing Aloe Vera and mineral rich kelp and skin-repairing blue-green algae. Hydrating your skin will help it look its best, reduce wrinkles, and prevent excess oil production. 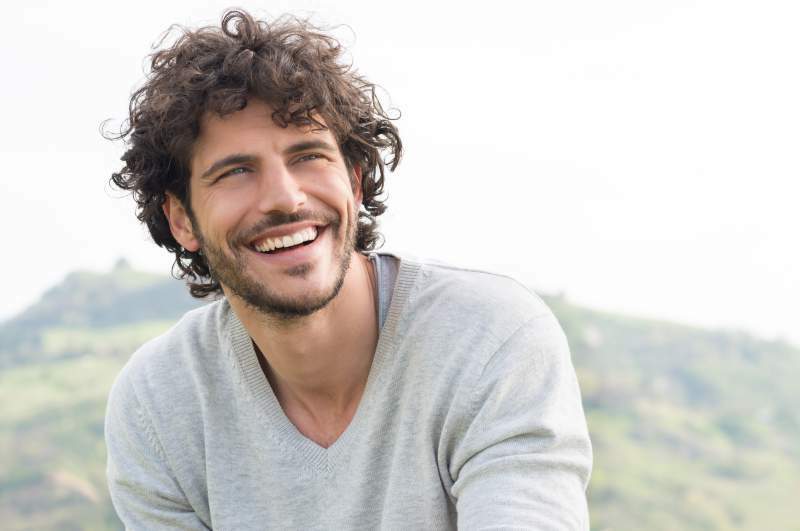 Use a lightweight moisturizer formulated for men's skin. Skin sensitized by shaving may not tolerate rich or greasy moisturizing products. Use a moisturizer that is right for your skin type day and night after cleansing and toning. 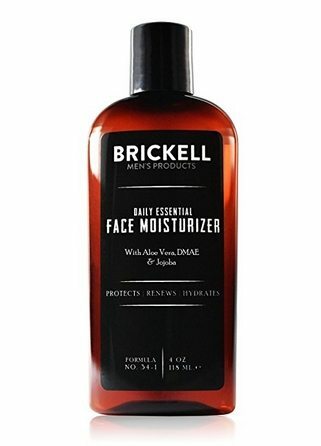 ​Brickell Daily Essential Face Moisturizer - ​Light, fast-absorbing oil free facial moisturizer ​hydrates, nourishes, renews, and protects your face without clogging pores. 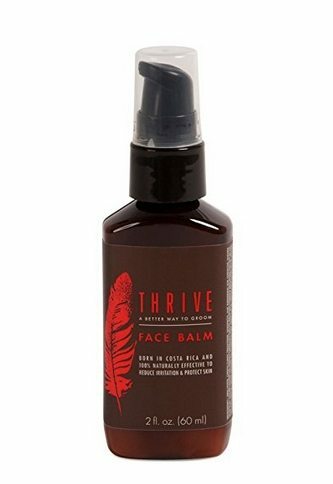 ​Thrive Natural Face Lotion for Men - ​Ideal for dry, oily, and combination skin types. It moisturizes, protects, and hydrates skin to restore its natural appearance. 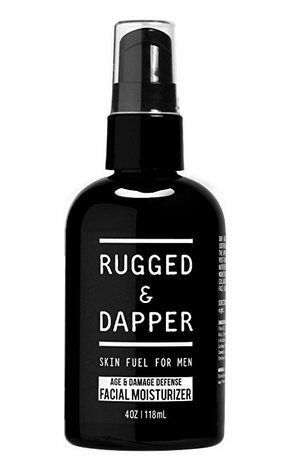 ​Rugged and Dapper Face Moist​urizer for Men - All skin types benefit from this moisturizer​. Helps with the appearance of fine lines, wrinkles, damage, dull uneven skin tone & shaving irritation. Men are not as diligent about their sunscreen use as women, but they should be. UV rays lead to accelerated skin aging and can cause skin cancer. It is important to wear a sunscreen if you are going to be outdoors for more than 30 minutes. 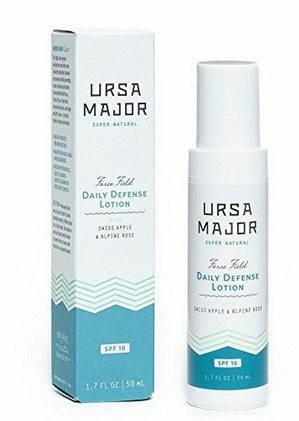 ​Ursa Major Daily Defense Lotion - A lightweight daily moisturizer with an SPF of 18. Many men shave either daily or every few days. Shaving products should protect and lubricate the skin. They should also be mild and soothing; harsh products can remove skin’s natural lipids which are already under pressure from shaving. ​Stop buying cheap razors. A quality razor can last a lifetime. Look for one that suits your skin's sensitivity and beard coarseness. If you are buying a razor from the drugstore, avoid buying one with multiple blades. These types are more likely to give you razor burn or ingrown hairs because the extra blades pull the hairs below the skin. Shave in the direction that hair grows, not against it. 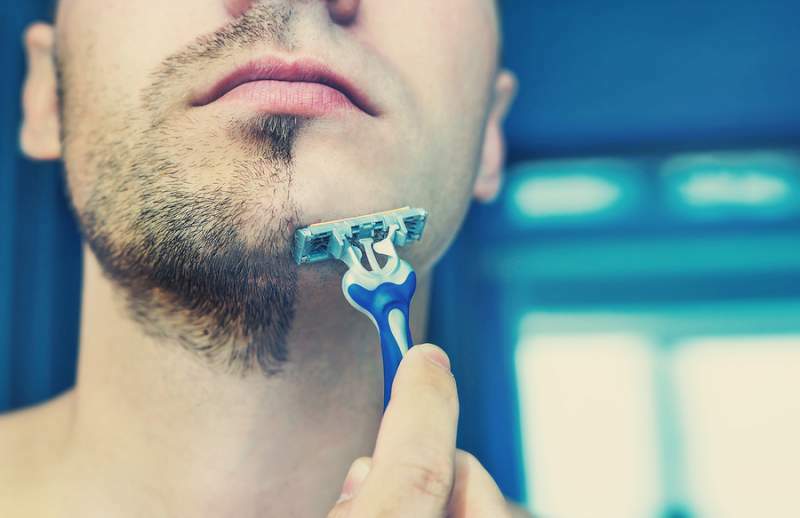 If you find you need to shave in the opposite direction of hair growth, do so slowly and gently. Use a shave cream or gel that is non-foaming to allow the blade to get close to the skin for the closest shave possible. The best time to shave is at the end of, or immediately following your shower. Washing your face before shaving helps soften the hairs which makes your shave smoother. Don't use very hot water as that will aggravate skin, leading to a tight, dry feeling, as well as redness. Shaving products that contain anti-bacterial properties protect the skin from shaving irritations. Be sure to rinse your razor often and replace every few shaves. Run your hands over your face and neck to ensure that you haven't missed any areas. 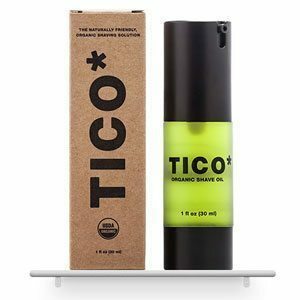 ​​​Tico Organic Shave Oil - Soothes, Heals and Nourishes Your Skin When you shave. 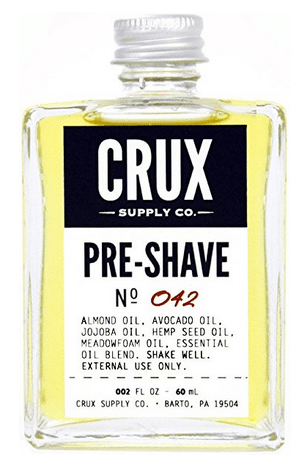 ​​Crux Supply Co. Pre-Shave Oil - A Wealth of Vitamins & Minerals Lift Whiskers For a Super Smooth Shave, & Protect Your Skin While Lending it a Healthy Glow. Cream lathers are rich and hydrating. They lubricate the skin and allow the blade to glide effortlessly over it. They also lock moisture into the skin, softening and soothing it after the shave. 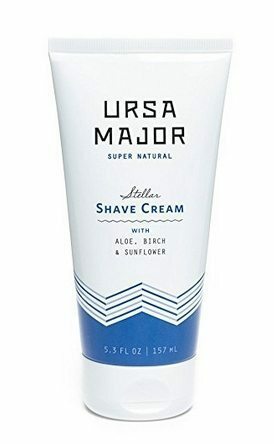 ​​Ursa Major Stellar Shave Cream - This concentrated, non-lathering shave cream softens tough whiskers, cushions against razor burn and naturally nourishes your skin. 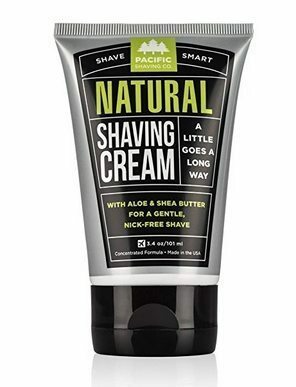 ​Pacifi​c Shaving Company Natural Shaving Cream - A unique, low-lather formula with safe, natural, and certified organic ingredients. After-shave hydrates and soothes the skin; it also seals in the skin after a nice shave. Look for an alcohol-free aftershave, because alcohol dries out your skin. ​​​Brickell Mens Instant Relief Aftershave - Light, fast-absorbing men's aftershave lotion is packed with natural ingredients. 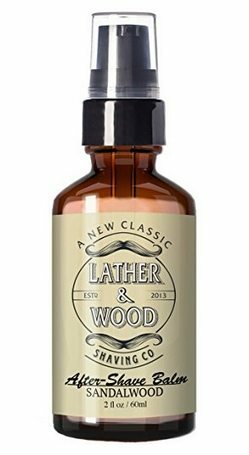 ​Lather and Wood Sandalwood Aftershave Balm - Alcohol free, soothes irritations, and heals razor burn. ​Facial hair wicks moisture away from your skin, which can create dry and flaky skin, as well as beard dandruff. Cleansing your beard is important. We recommend using a natural shampoo for men to wash your beard and the underlying skin a few times a week. Don't use regular soap, as this will dry out your skin and make it look weathered. 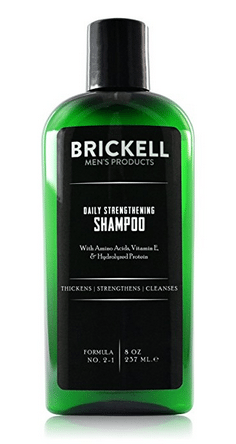 ​Brickell Men's Daily Shampoo - Creates stronger, fuller hair with a unique combination of natural ingredients. Use a facial scrub a few times a week to remove dead skin cells from underneath your beard. Take your time to get all the skin under your beard, especially if your beard is long. A moisturizer is essential to hydrate the skin. Massage your skin moisturizer in well. 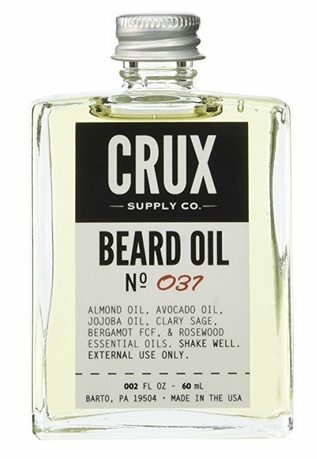 If you are not using a beard oil, make sure to massage some of the moisturizer into your facial hair to keep it soft and hydrated. 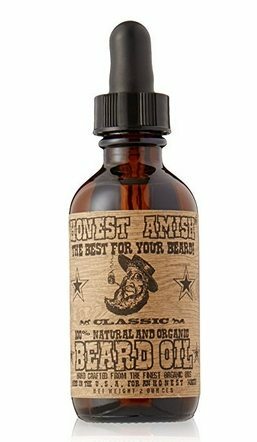 ​Honest Amish Classic Beard Oil - 7 expertly selected premium oils as well as 7 essential oils that target hair growth, conditioning, beard and skin health. Consistency is key to any successful anti-aging routine. Pick a routine and stick to it. Using a cleanser formulated for your skin type as well as using a daily moisturizer will go a long way to preventing the signs of aging. Other products can be added for a more targeted treatment; these include anti-aging serums, moisturizers, and eye creams. A facial serum is designed to deliver essential nutrients deep into your skin, where cellular repair and turnover occur. Skin cells deep in our skin are prone to inflammation and free radical damage that most products are unable to fight. A serum will deliver powerful youth-enhancing nutrients into these deep layers of your skin. Serums are different from moisturizers in that they do not contain thickening or lubricating ingredients. They, therefore, absorb more quickly into the skin. Because serums have no "fillers," they are more concentrated in active ingredients. ​​​Brickell Reviving Day Time Serum - Boosts skin elasticity, restores firmness, and stimulates collagen production. A night cream formulated with anti-aging ingredients such as aloe, hyaluronic acid, DMAE, and green tea will help keep your skin looking young. Using cream at night will allow the cream to work with your body's natural restoring process. 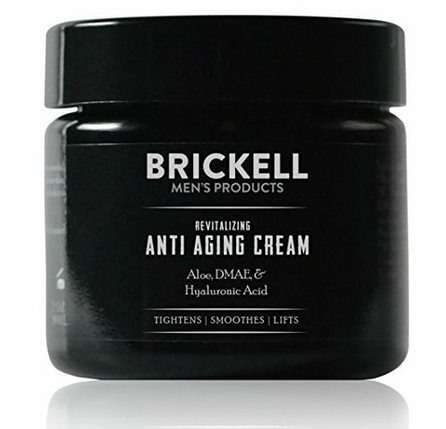 ​​​​Brickell Revitalizing Anti-Aging Cream - Significantly diminishes wrinkles, lines, crow's feet, and other signs of aging. Your eyes are often the first part of your face to show wrinkles. A good eye cream will combat wrinkles, puffiness, and dark circles. Use an eye cream both morning and night. Caffeine to contract the blood vessels around the eyes, reducing dark circles and puffiness. Methylsulfonylmethane (MSM) to help your skin cells absorb the caffeine. Hyaluronic acid, a natural ingredient which plumps skin cells and reduces wrinkles. In the morning, apply your eye cream after your face moisturizer to help combat puffiness and dark circles. At night, use your eye cream after your night cream to help keep the skin around your eyes firm and hydrated. Dab a pea size amount on your pinky finger and smooth over the skin under your eye and around your eye socket up to the bottom of your eye brow. 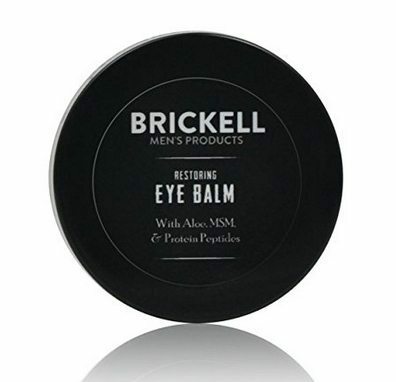 Brickell Restoring Eye Cream - Reduces bags, puffiness, dark circles, and wrinkles around the eyes. Warm showers open pores and allow dirt and bad oils to be removed. Bar soap works fine as long as your skin isn't dry. If you have dry skin, opt for a liquid body wash that contains plant oils such as jojoba or sweet almond. 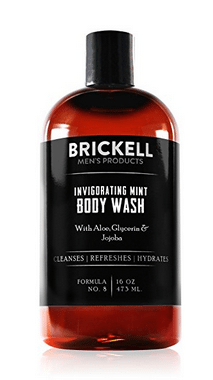 ​Brickell Invigorating Mint Body Wash - Deep-cleans your skin of oil, sweat, and grime without stripping essential moisture. 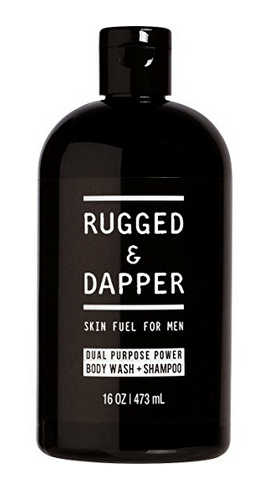 ​Rugged & Dapper Body Wash and Shampoo - Great for all skin and hair types, blonde, oily, dry, silver, thinning and color treated hair. ​Many men don't need to moisturize their body because their skin is naturally oily. However, some men have dry skin. A moisturizer will go a long way to combating any dryness. Use a moisturizer right after a shower. Focus on areas that are prone to dryness, such as the elbows, knees, shoulders, lower legs, and hands. 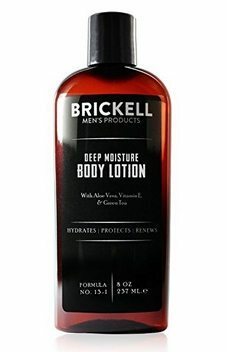 ​Brickell Deep Moisture Body Lotion - Keeps your skin tight and hydrated in the toughest conditions. ​Brickell Maximum Strength Hand Balm - Light, fast-absorbing natural hand lotion for men that is packed with potent natural ingredients to hydrate, protect, and tighten your skin. ​I hope you learned some valuable information about men's organic skin care here. Please leave any questions you may have in the comments, or contact us. We are here to help!